His name is James McGill, but most of us know him as Slipping Jimmy, or Saul Goodman, an ethically conflicted advocate for the unlawful. Making his debut in season two of ‘Breaking Bad’, actor Bob Odenkirk brought life to his loveably shady character, providing comedic relief in an otherwise dark show. Today, Saul Goodman returns to fans in a spin off show titled ‘Better Call Saul’ which is set in 2002, long before he meets Walter White and Jesse Pinkman. 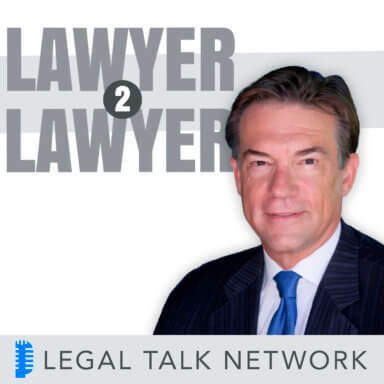 In this episode of Lawyer 2 Lawyer, host Bob Ambrogi interviews Nicole Hyland author of The Legal Ethics of Better Call Saul blog. Together they discuss the ethical blunders of Saul Goodman, why he’s so likeable, and whether or not he’s a good person. Tune in to hear how Saul’s questionable antics stack up against real life rules of professional conduct and how what’s technically legal isn’t always what’s right. Advertiser: He’s an exaggeration in some ways, but there’s an awful lot that’s very real about him in terms of some lawyers I’ve run across in my life. I wonder what you think about Saul Goodman as a real character. There are lawyers out there who are like him. Certainly Saul Goodman has jumped the shark in terms of ethics, but Jimmy McGill I think is someone who inherently has a bit of larceny in him. We know he was a criminal before he became a lawyer, a petty criminal. But I think he is someone who has a good heart and is trying to do the right thing. Bob Ambrogi: Hello and welcome to Lawyer 2 Lawyer on the Legal Talk Network. This is Bob Ambrogi coming to you just outside of Boston, Massachusetts where I write a blog called LawSites and where I also practice law. Before we introduce today’s topic, I’d like to take a moment to thank our sponsor, Clio. Clio is an online practice management program for lawyers. You can find out a lot more about it on www.GoClio.com. Breaking Bad was one of the most popular television shows in history. In it, a likeable, albeit, ethically-challenge character emerged in season 2 and gave the audience some degree of comic relief. Of course, we’re talking about Saul Goodman, which as good writing would have it, wasn’t even his real name in the show. Saul, also now known as Slippin Jimmy was known for skirting the lines of ethical corruption on his best day while flat out crossing it on his worse. Despite his various flaws, the audience came to love his character so much that a spin-off was born featuring him as the main character in a show that debuted this year called, Better Call Saul. Taking place before he meets up with Walter White and Jesse Pinkman, the show recaps the history of what made Jimmy McGill into Saul Goodman ethically challenged, I guess, advocate for the unlawful and with a number of ethical issues raised along the way. Today we’re going to talk a little bit about the ethics of Saul Goodman and we’re fortunate to have with us today to help us do that, Nicole Hyland. Nicole writes a Tumblr called The Legal Ethics of Better Call Saul, which has been featured in Slate and Above The Law. She has years of experience in the area of ethics, in addition to being a partner in the litigation and professional responsibility groups at Frankfurt Kurnit. Nicole is chair of the committee on professional ethics of The New York City Bar Association, co-chair for the Ethics Committees of the Women’s Bar Association of the State of New York, and on the board of the Association of Professional Responsibility Lawyers. And if that was not enough, she’s also the co-author with Professor Roy Simon of Simon’s New York Rules of Professional Conduct Annotated, she’s on the editorial board of the New York Legal Ethics Reporter, and a contributor to the Legal Ethics Forum blog. So if anybody could help us evaluate the legal ethics of Saul, it’s Nicole Hyland. So welcome to the show, Nicole. Nicole Hyland: Thank you very much, I’m very happy to be here. Bob Ambrogi: Thanks. Well, let’s just start by having you tell us. What inspired you to start writing this blog? Nicole Hyland: Really, two reasons. I do write and teach a lot about legal ethics and I find that it can be a dry subject for some people, so I try to use colorful examples when I’m teaching and writing about the subject. And, of course, Saul Goodman and the show provides such a wonderful example. But really, what compelled me to write about this issue is I’m a big fan of the show, I was a fan of Breaking Bad and I have a tendency when I really get into a show to go out there and listen to other podcasts that talk about the show and read about it and I just found that whenever commentators would turn to the subject of ethics and whether Saul – or as he’s known on the show right now as Jimmy – whenever he would do anything that sort of seemed questionable, they would start talking about well is that permitted, is it not, is it okay, can lawyers do that. And they would, understandably, often get it wrong. And I would just find myself in my head yelling going no or yes or arguing with them in my head and thinking I think I just have to get this off of my head and on to some other medium. And so I started writing about it. I initially was posting my post on the legal ethics form and some other places and then I just decided to collect everything onto the Tumblr blog so that it was all in one place and people could easily find it if they wanted to. Bob Ambrogi: Well, it’s really fun to read, I’ve got to say. For our listeners, it’s EthicsOfBetterCallSaul.tumblr.com is where you could find it. I have to confess that I did not start watching the show when it debuted earlier this year and been binging on it a little bit over the last week or two trying to get caught up and still haven’t watched all the episodes. Nicole Hyland: Oh, okay; I don’t want to spoil anything for you. Bob Ambrogi: No, that’s okay. As an interviewer I should be better prepared. I felt it was my obligation to sit and binge on Better Call Saul for a few days; beats practicing law, I can say that. But I have to say, in watching it I found myself wondering. He’s an exaggeration in some ways but there’s an awful lot that’s very real about him in terms of some lawyers I’ve run across in my life. I wonder what you think about Saul Goodman as a real character, if there were lawyers out there who are like him. Nicole Hyland: I think you have to distinguish between Saul Goodman, the character in Breaking Bad, and Jimmy McGill who is a much earlier iteration of a person who becomes Saul Goodman. And I think even Jimmy would admit that Saul Goodman is not really who he is. He’s a character he puts on and presents to the world. Jimmy McGill is who this person really is and he is certainly evolving and will eventually evolve into Saul Goodman. But Jimmy McGill is, I think, in many ways very typical. Some of the more extreme behavior that we can get into talking about I think is fairly exceptional. But a lot of the things that he does, a lot of the little ethical quandaries that he has to deal with and his conduct, it’s typical of the things that lawyers face every day. Issues of confidentiality and advertising and prospective clients; lawyers face these questions on a daily basis. Bob Ambrogi: So what’s your overall assessment of Jimmy/Saul? Do you rate him overall as an ethical lawyer with some lapses or as an unethical lawyer who occasionally does the right thing? Where does he fall under your judgement? Nicole Hyland: I think, even certainly, Saul Goodman has jumped the shark in terms of ethics by the time we get to Breaking Bad, but Jimmy McGill I think is someone who inherently has a bit of larceny in him. We know he was a criminal before he became a lawyer, a petty criminal. But I think he is someone who has a good heart and is trying to do the right thing, at least at this point in the show; but to constantly have to battle with that side of his personality that has a hard time resisting a scam. Bob Ambrogi: What do you think is the appeal of that character to give him his own series as a spinoff suggests that he was wildly popular when Breaking Bad was showing. Why do you think people are so fascinated with Saul Goodman. Nicole Hyland: I loved him, even on Breaking Bad when he was so unethical; as an ethics lawyer, that might sound strange. But he’s funny, he’s charming, he’s clever, he’s a great talker – he’s always talking himself in and out of situations; and he’s very appealing. Bob Ambrogi: It’s also interesting reading your blog about him because you often give him credit for doing the right thing. It’s not all a bunch of messups so far. In fact, I think you’ve used the word competent a number of times in your blog in reference to him. Or at least in reference to things he’s done. Nicole Hyland: That’s really true. I do try to give him credit because I am hard on him a lot of the time. So when he does something right I really do try to highlight that and one of the areas where I’ve seen that the most is with his competence. He’s naturally good at being a lawyer. Even when he doesn’t have technical competence in a particular area, he’s willing to learn and he is a great listener when he’s talking to a client and getting information. He really has a great instinct, and perhaps because he has a criminal background, he has an instinct of noticing things. So for example, when he meets with his elder law client at the assisted living facility, he’s asking her for information about her estate planning and picks up on something she says that leads him to investigate the assisted facility and learn that they are engaged in fraud. So for a lot of people, that might have just gone over their heads, but he notices it and he digs into it and follows through with it. So he’s very good at listening and noticing things and investigating things. Bob Ambrogi: I think you even suggest that he seems to have a natural propensity or natural talent for elder law for working with these clients. But it did raise one of the first of many ethical conundrums that you wrote about, I think which was the Jell-O cup incident. I wonder if you could talk a little bit about that and what you thought of it. Nicole Hyland: Just to comment on his natural vicinity for elder law, even Jimmy says old people love me. And when he’s trying to defend against the injunction that the assisted facility tries to bring against him and he wins on that, and his clients do love him, that’s clear; so as the show progresses, you see that. But yeah, the Jell-O cup was – there was an advertising and potentially a solicitation issue. He had these little Jell-O cups manufactured which he has the assisted facility people handing out. He wasn’t actually handing them out, which was interesting, but he was present while they were being handed out, and he wasn’t specifically asking people to hire him. He was making comments about going around and introducing himself and when he shakes someone’s hand, he says watch out, that’s my will-writing hand. So he doesn’t actually offer to be hired as an estate planner or elder lawyer, but he hints and indicates that that’s what he does in various ways. The Jell-O cup comes into play as the clients of the assisted living facility are eating the Jell-O. They get to the bottom and it even says to them, make sure you get all the way to the bottom. And right at the bottom it says need a will, call McGill, and with his phone number. So what I comment on in my blog is first of all, it is lawyer advertising – at least under the New York definition it would be, because it’s a primary purpose of this material, this communication that he’s sending out to these people for the purpose of getting business, getting clients to hire him. So he doesn’t technically comply with the advertising rules, which would require him to put attorney advertising on it, and to have his law firm address, principal place of business address on the Jell-O cups. Bob Ambrogi: Maybe we should just stick with that episode for a second because the other thing you’ve written about it in your blog is his preparation, really, for that visit to the assisted living facility that he goes to. He kind of decides he’s going to emulate – channel – Matlock and dresses like him, tries to sort of adopt his persona. You address the question of whether that’s appropriate. Bob Ambrogi: Of course, the first one that you alluded to when he adopted the dress and style of Hamlin and even, apparently, the trademark of the Hamlin firm was for a much different purpose. He was really trying to provoke a response, perhaps, or at least get even with somebody. What about that whole incident with the billboard and the picture of him dressed to look very much like, more or less, his nemesis in the series. Nicole Hyland: The funny thing about that is his motives aren’t totally clear and seem to evolve, or at least unravelled, through that episode. Because initially, you do only think it’s because he’s upset at Hamlin and he wants to sort of get back at him. But then you realize later he’s staged this entire publicity stunt around these billboards. So the whole idea of provoking Hamlin led to the court hearing on the trademark issue which led to him being ordered to take the billboard down which then led to him being able to stage this incident, which got him all this publicity and some business from clients. So what was his real motivation? Did it evolve, or was it always a plan for him to use this to market himself? It’s hard to say but in the end that’s how he ended up using it. And one could argue that it was a form of deceptive advertising for him to do that. So technically, that could have violated the advertising laws. Bob Ambrogi: His motives are often ambiguous, it seems. Nicole Hyland: Yeah, lots of people’s motives in this show have been ambiguous and have been uncovered slowly. Bob Ambrogi: We need to take a short break so stay with us, Nicole, we’re going to be right back after a few words from our sponsors. Bob Ambrogi: Welcome back to Lawyer 2 Lawyer. This is Bob Ambrogi, and with me today is Nicole Hyland, author of the blog, The Legal Ethics of Better Call Saul, and we’re talking about the legal ethics of better call Saul. I’ve been throwing out a couple of the incidents that have happened in the show, but I wonder what for you was the most difficult to dissect of the episodes you had written about. What’s been the most, maybe ethically gray incident that you’ve written about? Nicole Hyland: I think one of the more difficult ones – and one I’ve actually just glossed over and perhaps didn’t even answer – was fairly early on in the series. There was a character, Nacho, who approaches Jimmy to conduct this scam against the Kettlemans who have been accused of embezzling about $1.5 million from the county. And so one of the questions as that arch developed was whether or not Nacho was false or Jimmy’s client, and at one point did he become the client so that Jimmy had an obligation of confidentiality towards him. And I felt that that was a question that was a little bit open and different people could differ on the stage at which he became a client. Because if he became a client at the initial meeting in the office, in Saul’s office, then Saul would have had the duty of confidentiality toward him not to reveal information or not to disclose certain information. But if he was not a client at that point, which arguably he wasn’t because he wasn’t approaching Jimmy to hire him but to engage him in a scam, then Jimmy would be freer to disclose certain information in order to hopefully protect against anything bad happening to the Kettlemans. So then of course under different rules, under the New York rules versus New Mexico’s rules, the exceptions to confidentiality which might give Jimmy the ability to disclose information are different. So depending on whether you’re under New York confidentiality rules or New Mexico, his obligations and what he’s permitted to disclose are slightly different. So I thought that was a little bit tricky there. Bob Ambrogi: And of course, you’re writing based on the New York rules, you’ve made that pretty clear. Although you’ll occasionally reference New Mexico rules on your blog. Nicole Hyland: This is one time when I did because I originally did my analysis under the New York rules and someone pointed out that it might be different under New Mexico so I did take that extra step at that point to go and research New Mexico. And I thought it was a great opportunity to talk about how these rules can differ from state to state. Bob Ambrogi: Another one of those sort of gray incidents regarding lawyer client relationship – maybe it’s not so gray at all- was when Saul visited the Kettlemans. This man was a former state treasurer or municipal state treasurer or something like that? Town treasurer? What was he? Nicole Hyland: The county treasurer. Bob Ambrogi: County treasurer, okay, who was accused of embezzling well over a million dollars and when Saul goes to talk to them and Mrs. Kettleman tells Saul in a sort of insulting way that he’s the kind of lawyer criminals would hire, guilty people. But she offers him some money to basically go away. You later discover he’s taken the money, you see him in his office counting through this pile of money. I don’t even know what to make of that, but what do you make of that exchange? Nicole Hyland: I did talk about that, that was episode 4, and I do talk about what happened there. The way I broke it down was she wants to give him the money, he says I can’t take a bribe. He keeps saying I can’t take a bribe, and then finally, he says I can take a retainer. And that’s what leads to her making the comment, we don’t want to hire you because you’re the kind of person that guilty people hire. You see in a later scene that he has taken the money, he then sits down and tries to rationalize it by treating it as it’s a legitimate fee of his legal services. And you see how absurd that is as he breaks it down. So I actually talk through, can he really treat it as a retainer, and I argue no, because no attorney client relationship has been formed. And she made clear that she didn’t want to hire him. So an attorney client relationship as a contractual relationship to which the client has to agree, and that didn’t happen here. So then I said, even if we did treat it as a retainer, does it comply with rules about amounts of legal fees and fees being reasonable and expenses being appropriate, not fraudulent. And if you go through and just analyze his breakdown of how he is going to treat his money, clearly is not a reasonable fee. $950 an hour which he refers to as his sort of exceptional, special, premium fee or something, trying to justify why he would be charging $950 an hour for someone who we know only gets $700 per dispense in his public defender role. Bob Ambrogi: Well, he wanted more. Nicole Hyland: But remember, even when he meets a prospective client who he thinks is a millionaire, he only quotes I think $450 an hour. So $950 an hour is probably something he could not justify as a reasonable billing rate for any of his work. So obviously, we all know this is a bribe and we all know he’s trying to justify it, but it’s sort of fun to break it down into exactly why it doesn’t fit in with the rules. Bob Ambrogi: You were on another podcast, the Slate’s TV Club podcast and I know that I listen to that and I know that they asked you about the dumpster diving incident. If I understood it correctly, you hadn’t actually seen the dumpster diving incident or the episode that had that as of the point that you were asked about that answer to that question. So here’s your chance, now that you’ve seen it, to amplify on that. He’s rifling through a dumpster looking for evidence. What do you make of that? Was that appropriate for him to do? Nicole Hyland: So when they asked me that, it was funny because it was the first question they asked me and it was about something I hadn’t seen, and not because I wouldn’t have immediately watch the show before it aired, but they record it before the show airs. So they had seen it but no one else had. So my answer was, based on my understanding of the law, a lawyer can. As long as something’s been thrown out in a dumpster, off the property of the person of the private property of the person throwing it out, you can search through it and that’s not a problem and it’s not in my view an ethical violation. Having then watched the show, I pretty much stand by my answer, which was assuming that was not on the property of the assisted living facility – which I don’t think it was – I think it probably was okay for him to search through the dumpster. Of course, it’s a disgusting scene and he didn’t actually have to search through the dumpster because right next to it was the very clean recycling bin where all the shredded paper was. But the issue was still the same and I think that’s been abandoned and it’s fine for someone to search through it, for the most part. Bob Ambrogi: What kind of response have you been getting from the legal community to your blog or from the non legal community, the community at large? What’s the response been? Nicole Hyland: Generally very positive. People seem to really enjoy a different perspective. There are plenty of podcasts and websites and reviews and commentators out there talking about the show generally, and this is a different angle. And I really only talk about the ethics issue. Every once in a while I’ll throw something else in, but for the most part I’m only talking about the ethics issues. And so I supposed probably most of the people reading it are other lawyers, although I think it goes beyond that. I think there are other people out there reading it. But I think people find it’s a fun way to learn about this topic. With what I said at the beginning, feel like a bit of a dry topic, so it’s fun for people to read it in this context and learn about these different issues. Bob Ambrogi: You’ve posted on your blog from at least one lawyer, another ethics lawyer, who took issue with a couple of your conclusions. Have you had much of that from other lawyers? Nicole Hyland: No, most people who read it have been pretty positive and have not really questioned my analysis, but Don Campbell is a Michigan lawyer, he’s actually a good friend, I’ve known him many years. So I suspect he may have optional personality disorder, but that’s a joke. He loves to argue, as lawyers do. So he took issue with two of my conclusions and had a different interpretation of the rules and reached a different conclusions. So I put a blog up with his analysis and then my response to that. I felt he had some good points but it didn’t change my mind about whether I thought the rules had been violated. But I always think it’s great to have another person’s perspective. It’s certainly possible for me to miss things or misinterpret things and having someone else come in and say I see it differently, is always a great conversation to have. Bob Ambrogi: So I’m looking at your blog right now and I’m seeing that it seems to end at episode 8 and there have been two more episodes since then, I think, if I’m counting right. When are we going to see your next two posts? Nicole Hyland: I’m planning to work on episode 9 this weekend and hopefully get that out by the end of the weekend. Episode 10, obviously, I’ll do a post on episode 10. I don’t know that there’s going to be a lot to say in terms of the legal ethics issues. There are a couple of points that I can make on that, but I think it’s more going to be a wrapup; I’ll make a few points on that episode and then more of a wrap up post. But I have a full time job so it’s hard for me to always get these out right away. Bob Ambrogi: Tell me about it, I feel your pain. So what happens now with the season over? Does the blog go into hibernation until the next season comes around or what plans do you have for it? Nicole Hyland: I was asked the same question when I was interviewed for Above the Law about this and my thinking has not solidified yet. One option is just put it on hiatus. It’s going to be almost a year, I think, until the second season starts, which is such a long gap and is a little disconcerting and disillusioning. But one option is to put it on hiatus and then focus on something else, one option is to go back to Breaking Bad and start looking at some of those examples when he becomes quite a different type of lawyer. So I’m still weighing my options. I think a lot of people are doing what you’re doing which is you’re either binge watching or even waiting until the show’s completely over and binge watching. I’m hoping people interest in this show will prompt an interest to people who didn’t watch Breaking Bad to go back to that show and start watching that on Netflix. So there may be an opportunities out there to keep talking about these issues as more and more people are introduced to this show and to the character. Bob Ambrogi: Well it’s a really good show and you’ve done a really good job writing about it. have you heard anything directly from anybody involved in producing the show? Nicole Hyland: The one thing that happened was when I tweeted one of my earlier posts, Patrick Fabian favorited the tweet, so that was kind of fun; he plays Hamlin. But in terms of any kind of official response, I haven’t received anything from the creators of the show. Bob Ambrogi: A Twitter brush with a celebrity. Nicole Hyland: Exactly. You know, if they have an insider podcast that they do, I’d love to – that’s really with people on the show, so I don’t know if they ever have guests. But I’m here if they ever want to talk to me. Bob Ambrogi: Yeah, I think they need you as a script consultant. You can help them with thoughts on some really unethical situations. Well, we’re just about at the end of our time. We do usually like to give our guests an opportunity to have a closing thought at the final word or anything else you’d like to say about Saul, about your blog, or about ethics in general. Nicole Hyland: I don’t really have anything brilliant to say about other than what we’ve talked about. I think, as I’ve said, it’s a fun show. I think it opens up a lot of issues that welcome people to read the blog and I’m always open to having a conversation about these things. I like when people tell me I’m wrong and having a dialogue about it. So please engage in the conversation, I think these are fun things to talk about. And anything to do with lawyering and professional responsibility and what does lawyer ethics mean. I guess if I was to summarize it into one thing, it’s important for people to understand that legal ethics is very different in many ways from real world ethics and morality. And I think that might be a misunderstanding that people have about the ways that profession is regulated. So some of the outcomes, when you apply these rules, don’t always subtail with the way people feel about what it means to do the right thing in everyday life. So I think that’s probably a key issue that people might want to be aware of when they’re thinking about legal ethics and how we apply these rules to lawyer conduct. Bob Ambrogi: That’s interesting. It makes me wonder if you think that this has helped the public understand legal ethics more or has muddied the issue all the more for them. Nicole Hyland: I don’t think we can blame any fictional character, any TV show about lawyers or people’s perceptions of lawyers in the profession, but certainly, people don’t really always understand how these rules work and how lawyer conduct is regulated. So they may have different expectations than how the real world works. Particularly, for example, in the area of confidentiality where sometimes the duty to hold information confidential can really get lawyers into difficult situations and ethical dilemmas with their own conscience. So we struggle with these issues, we’re still trying to figure them out and sometimes it’s not easy. Bob Ambrogi: Well the blog is The Legal Ethics of Better Call Saul; the writer is Nicole Hyland, she’s been our guest today. We really appreciate your taking the time to talk to us. Readers, listeners, can find that at EthicsOfBetterCallSaul.Tumblr.com or just Google it and you’ll find it. Thanks so much for taking the time. It’s really been fascinating talking to you and I loved reading your blog. Nicole Hyland: Thank you very much, thanks for having me as a guest. Bob Ambrogi: That brings us to the end of another episode of Lawyer 2 Lawyer. Join us next time for another great legal topic. When you want legal, think Lawyer 2 Lawyer.